Glossy photo calendars are more than just part of the modern landscape. They are an effective tool for promoting your business! Photo Calendar Creator lets you easily prepare original advertising designs for any year or month. 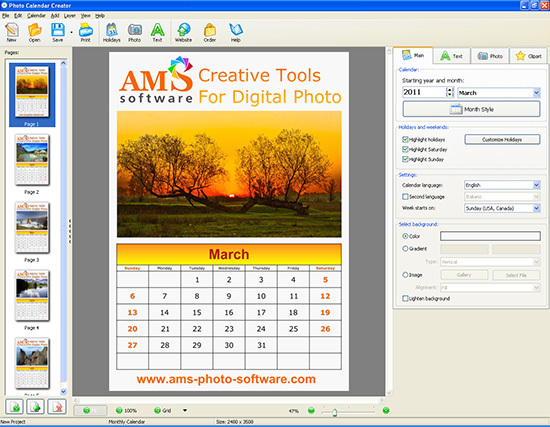 This calendar maker software is rich with all of the features for making a professional-quality promotional calendar. It's easy to add photos, throw in your company's logo, and include contact information for your company as well. Calendars are an important part of daily planning and a natural interior element in any modern office. That is why promotional calendars are such an effective advertising tool. Corporate calendar is an excellent gift for all of your clients and business partners.